Modular Auto Feed System, Batch Counter.1992 Haeger HP-C-2 6-Ton x 18” Hardware Insertion Press s/n 2436 w/ Auto Bowl Feeder. Haeger 6 ton x 18” Hardware Insertion Press s/n NA w/ Auto Bowl Feeder. Pem-Serter PS-500 6 Ton x 12” Hardware Insertion Press s/n 500-42 w/ Auto Bowl Feeder and Tooling. Haeger 6 ton x 18” Hardware Insertion Press (Needs Work). Roundo AB mdl. P130/4 50” x ¼” Power Roll s/n 8513. Pexto mdl. PX24A 16GA x 24” Finger Brake s/n 5/47. (3)Roper Whitney No.100 6” x 6” Corner Notchers Greenerd No.3B 3-Ton Arbor Press. MEP SV315 Automatic Miter Cold Saw s/n 2132. Brobo “Super 300” 12” Miter Cold Saw. Powermatic mdl. 87 Vertical Band Saw s/n 887416 w/ Blade Welder. Pistorius mdl. B Sliding Table Abrasive Saw s/n 6894. Rockwell/Delta 12” Cutoff Saw w/ Conveyor. Timesavers 137-2HDCMW 2-Head 36” Wet-Belt Grainer s/n 21079Y w/ Filtration and Air Knife. Timesavers 113-1MW 12” Wet-Belt Grainer s/n 10843. Brown & Sharpe “Micromaster 618” Automatic Surface Grinder. K.O.Lee mdl. B300 Tool and Cutter Grinder s/n 15034. Boyar Schultz “Challenger H612” 6” x 12” Surface Grinder (No Chuck). (2)Burr King mdl. 760 2” Pedestal Belt Sanders. Powermatic mdl. 33B 6” Pedestal Belt Sander s/n 7833263. (2)Kalamazoo 2” Pedestal Belt Sander. Dayton 10Hp Horizontal Air Compressor w/ 120 Gallon Tank. Powermatic mdl. 1150 Pedestal Drill Press. (3)Rockwell and Jet Pedestal Drill Presses. (2)Clausing mdl. 1630 Bench Model Drill Presses. Chamfrit Chamfering and Deburring Machine. Hardinge DV59/DSM59 Second Op Lathe s/n DV-59-18121 w/ Tailstock, 6-Station Turret, Cross Slide, Cutoff Attachment, 6” 4-Jaw Chuck. Clausing mdl. 5938 14” x 36” Lathe s/n 530500 w/ 52-1700 RPM, Inch Threading, Tailstock, 5C Collet Closer, 8” 4-Jaw Chuck.Lagun FT-2 Vertical Mill s/n 4919 w/ DRO, Chrome Ways, Power Feed. Wells Index mdl. 847 Vertical Mill s/n 21333 w/ 50-4200 RPM, Power Feed. Strippit Fabri-Center 1250SXP mdl. FC1250SXP 30 Ton Cap CNC Turret Punch Press s/n 1174052694 w/ Fanuc 0-P Controls, 33-Station Turret. Strippit Fabri-Center 1250SXP mdl. FC1250SXP 30 Ton Cap CNC Turret Punch Press s/n 1173052694 w/ Fanuc 0-P Controls, 33-Station Turret. 1990 Finn-Power TP3015 IF2/22/SU 300kN CNC Turret Punch Press s/n 2.0-30152389 w/ Siemens Sinumeric 3 Controls, 22-Station Turret. Amada RG-125 125 ton x 10’ CNC Press Brake s/n 01250707 w/ NC9-GS Controls, 15.76” Throat, 100.5” Between Uprights, 3.94” Stroke, 14.85” Open Height. 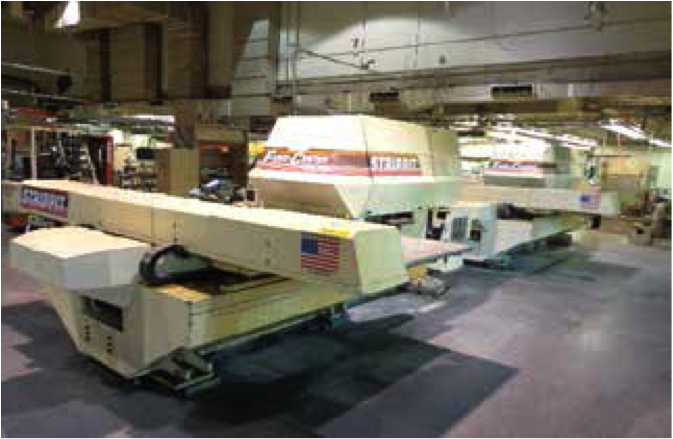 Cincinnati 90AFx6’ 90 Ton x 6’ Cap CNC Press Brake s/n 48348 w/ Cincinnati Autoform Controls, 14” Stroke, Light Curtain. Cincinnati 90AFx6’ 90 Ton x 6’ Cap CNC Press Brake s/n 45408 w/ Cincinnati Adaptive Autoform Controls, 8” Stroke, Light Curtain. 1996 Amada RG-80 80 Ton x 8’ CNC Press Brake s/n 811127 w/ NC9-EX II Controls, 3.94” Stroke, 15.75” Throat, 80,8” Between Uprights, 14.58” Open Height. 1993 Toyokoki / Mitsubishi APB-5613W 48” CNC Press Brake s/n APB4993 w/ Toyokoki TNC-AC II Controls. 1993 Toyokoki / Mitsubishi APB-184 24” CNC Press Brake s/n APB2092 w/ Toyokoki TNC-ACI Controls. 1993 Toyokoki / Mitsubishi APB-184 24” CNC Press Brake s/n APB1193 w/ Toyokoki TNC-ACI Controls.DiAcro 14-48-2 14GA x 48” Press Brake s/n 6820978384. Wysong mdl. 1072 10GA x 72” CNC Power Shear s/n P119-108 w/ Wysong PC100 Shear Gage, Front Supports. Fadal VMC20 CNC Vertical Machining Center s/n 9210683 w/ 16-Station ATC, CAT-40 Spindle. Trak K3S CNC Vertical Mill s/n 042AK12693 w/ ProtoTrak SM Controls, Chrome Box Ways, Power Draw Bar.Spindle Wizard mdl. MK2 3-Axis CNC Vertical Mill s/n 266 w/ Shadow Controls, 24-Station ATC, NTMB40 Spindle.Spindle Wizard mdl. MK2 3-Axis CNC Vertical Mill s/n 293 w/ Shadow Controls, NTMB40 Spindle. Pneumatic Clutch, 34” x 33 ½” Bolster Area. Strippit “Custom AG 18/30” NC Duplicator Press s/n 726010986 w/ Strippit Controls. (2)Miller Syncrowave 300 AC/DC Arc Welding Power Sources. Miller Syncrowave 250 CC AC/DC Arc Welding Power Source s/n KA790979. Miller XMT304 CC/CV DC Inverter Arc Welding Power Source s/n KG235897. Miller XMT300 CC/CV DC Inverter Arc Welding Power Source s/n KE744720. Miller CB-8A Extended Reach Boom Cart. Miller XRA Extended Reach Wire Feeder. Taylor Winfield ENB-12-75AIROPER 75kVA Spot Welder s/n 54537. Western Arctronics 50kVA x 24” Spot Welder s/n FG868. Western Arctronics 30kVA x 24” Spot Welder s/n FC346. (2)3’ x 6’ T-Slot Welding / Layout Tables. AMW American Metal Wash mdl. 1500-2 Rotary Wash System s/n 92-445. Grieve SB-550 18kW 350 Deg. Electric Oven s/n 48224. Precision Quincy mdl. 82-450T Electric Curing Oven s/n 28082-1. (2)Binks Open End and Enclosed Paint Booths. NuArc mdl. FT26V2UP Ultra-Plus Flip-Top Vacuum Frame Plate Maker s/n KM-L87-004. NuArc mdl. FWV24 Plate Washer s/n 138G69-2. Innovative Design Enclosed Screen Washer. (4)Vidmar 12-Drawer and 11-Drawer Tooling Cabinets. (5)Racks of Amada Press Brake Tooling. Strippit and Fin-Power Punch Die Tooling. Fowler Trimos 12” Height Master w/ 12” Riser. (4)Mitutoyo 24” & 12” Dial Calipers. SPI and Starrett Dial Chamfer Gages. Scherr Tumico and Starrett OD Mics. s/n CYM02-004503 w/ Side Shift, Charger. ½ To Cap Portable A-Frame Gantry w/ Chain Hoist. Vacuum Form Packaging Machine s/n 86-A-547. Vacuum Form Packaging Machine s/n 85F340.